It's an embarrassment of riches in this showdown of two leading semiconductor stocks. As we hurdle toward the finish line, 2016 will go down as a uniquely active year in the semiconductor market. Spurred on by the onset of several generational tech trends -- the Internet of Things (IoT), artificial intelligence, self-driving cars, and the like -- major semiconductor companies have gone on a buying spree to prepare them to cash-in on this growth. 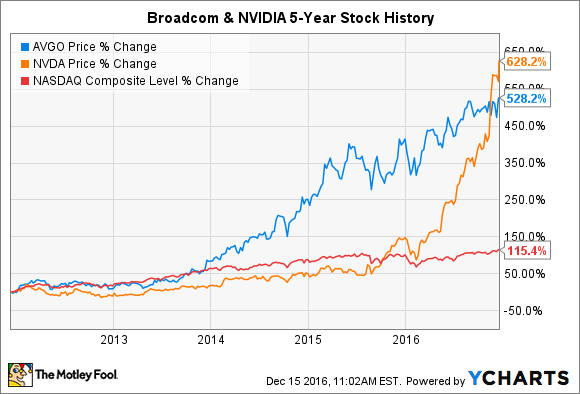 Two such names that sit smack dab in the middle of these growth markets are NVIDIA (NASDAQ:NVDA) and Broadcom (NASDAQ:AVGO), whose shares have handily outperformed their benchmark over the past five years. Both NIVIDIA and Broadcom are attractive in their own right, but which semiconductor stock is the better buy today? In this article, we'll run both stocks through a three-part gauntlet to see if one is more deserving of investors' attention. The first prism through which we'll analyze these semiconductor stocks is the strength of their balance sheets. Though their investment theses lie in their revenue and profit growth stories, investors need to understand a given company's financial strength in any investment scenario. In looking at NVIDIA and Broadcom, though, both companies appear fine for the most part. A few important distinctions emerge, however. To get this out of the way, NVIDIA is the clear winner in every category here. NVIDIA has more cash and liquid assets on hand, carries less debt, and generates more cash flow from its core business. There's really no way around this or disputing it. However, the important nuance in comparing the two companies is that Broadcom's financial position isn't a negative either, especially given the company's intelligent acquisition strategy (see Part 2 below). Simply stated, Broadcom, along with its pre-merger counterpart Avago, has been one of the most prolific acquirers of semiconductor companies, a part of the broader trend of rapid consolidation we've seen within the chip industry. In fact, Avago funded part of last year's transformational merger with Broadcom by issuing $9 billion in fresh debt. The combined company is undeniably stronger as a result of the Broadcom-Avago merger and other recent acquisitions, so Broadcom's current debt burden is most appropriately viewed as the cost of the company's transformation into a company poised to dominate the Internet of Things chip market in coming years. Unlike the above section, it's far harder to determine which company holds stronger competitive advantages. Simply said, both companies are enviably positioned to dominate their markets for years to come. Broadcom's area of focus is connectivity. The company operates four reporting segments -- wired infrastructure, wireless communication, enterprise storage, and industrial and other -- that help make our increasingly connected world tick. Its chips appear in smartphones, cellular base stations, Internet of Things devices like smart appliances, data centers, and more. The company's semiconductors touch multiple points of the connectivity value chain, as well, which is fantastic news given the unprecedented growth opportunity the IoT presents. According to Ericsson, the number of IoT connected devices is set to grow from 4.2 billion to 14.2 billion by 2021, and Broadcom's offerings will be selling directly into this trend from a place of market leadership. As such, there's little doubt that investors should love Broadcom's competitive stance at present. As enviable as Broadcom's competitive positioning is, though, graphics chip leader NVIDIA's competitive advantages are every bit as compelling. Akin to Intel's dominance of the CPU microprocessors that power PCs, NVIDIA is the undeniable leader in the high-end graphics chips that lie at the heart of growth markets like self-driving cars, artificial intelligence, and machine learning. In fact, NVIDIA's chips power the budding AI or cloud platforms for Amazon, Facebook, Alphabet, IBM, and Microsoft. Its chips also underpin the self-driving car efforts of Tesla, Audi, Baidu, and many more. It's for this reason that analysts see NVIDIA's earnings per share compounding at a 28% annual clip over the next five years, and there's a legitimate case to be made that Wall Street still underappreciates NVIDIA's growth story. When it comes to valuation, the case becomes somewhat more clear cut. As you can see below, NVIDIA is priced for meaningful growth, deservedly so as we learned from the section above. However, Broadcom's valuation multiple is more appealing, though a bit harder to gain a sense of as the result of some merger-related accounting. In the past three quarters, Broadcom has booked $1.5 billion in non-cash merger-related charges, which has artificially depressed its generally accepted accounting principles (GAAP) earnings. In backing those charges out, the company's normalized earnings per share for 2016 come to $10.84 per share, a very reasonable price for a company with Broadcom's positive growth outlook. Both NVIDIA and Broadcom sit at the middle of some of the most important growth markets in tech today. As such, each company should experience impressive sales and profit growth in the coming years. If we're splitting hairs here, you can make a plausible case that Broadcom's lower valuation makes it the better bet. However, the more important big-picture takeaway is that both NVIDIA and Broadcom are fantastic options for investors looking to participate in the next wave of semiconductor market growth.